There are 3 different types of Killer Bee character in Naruto Online game. We have covered two of them previously. Check them out on the following link. Taijutsu, Ninjutsu Tailed Beast Form [Prompt]: Cause damage, 4 COMBO, and Ignition to up to 9 of the opponent’s units, while also causing Knockdown and Suppression of Super Armor until the end of the round to the selected unit. Taijutsu, Ninjutsu Tentacle Swipe: Attacks up to 3 of the opponent’s units in the front line and has a high chance of causing Repulse. Taijutsu, Ninjutsu Tentacle Tackle: Chases and Attacks a Knocked Down unit, causes Knockdown and Immobile. 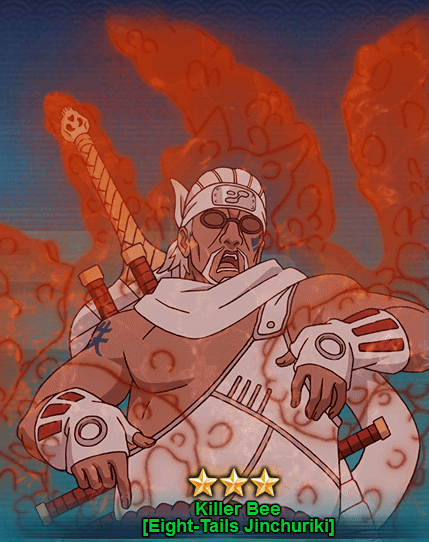 Ninjutsu Tailed Beast Chakra: Before Killer Bee’s action each round, he gains 20% increase to Ninjutsu and Immunity to all Debuffs.